For the past 10 years, there have been two constants during this festive time of year. The first is the global trek Santa Claus will make on Christmas Eve as he visits children from around the world. The second is a new Christmas-inspired mystery from the master of the Victorian era, Anne Perry. The interesting thing about A CHRISTMAS HOPE, as well as the previous 10 novels in the Christmas series, is that they all feature various characters from the literary universe Perry has created. With small exception, all of her mysteries feature either William Monk or Charlotte and Thomas Pitt. The era is the same for both, and occasionally characters drift in and out of the two series. A CHRISTMAS HOPE stars Claudine Burroughs, who has worked at the same clinic as William Monk’s wife, Hester. She is a periphery character of the Monk series who now has the opportunity to step up as the protagonist in this new holiday mystery. Claudine is an unhappy woman who is only alive and happy when she is working at the clinic. 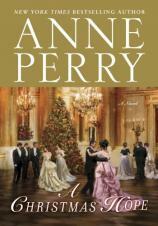 "With A CHRISTMAS HOPE, Anne Perry once again plays her part in adding another one of her signature Victorian mysteries to the Christmas series, which has now become an annual visitor in her readers’ homes. The messages of hope, justice and peace on earth continue to ring true." It is the Yuletide season, and Claudine and her husband, Wallace, are guests at an exclusive holiday party. Wallace is comfortable rubbing shoulders with the wealthy and powerful of London society, and does not approve of the work Claudine does at the clinic. While mingling at this gathering, a horrific event takes place. Someone has snuck in a streetwalker to the party, and she ends up getting attacked. The end result of this violent action is the unconsciousness and nearly lifeless body of the streetwalker --- a woman identified as Winnie Briggs. When Winnie ends up dying from her head wounds, the police are in search of her killer. All fingers are pointed at a local poet named Dai Tregarron. Claudine spent some time chatting with Dai and found him to be charming and far from a violent killer or molester of women. Claudine believes that Winnie was actually brought to the party by a trio of young men --- all from wealthy families --- and that they are behind her unfortunate end, as well as pinning it on Dai. She is not sure who to turn to and decides to enlist the assistance of the clinic’s bookkeeper, Squeaky Robinson, himself a recurring character in the Monk series. Squeaky reluctantly decides to aid Claudine as he also believes in Dai’s innocence. With A CHRISTMAS HOPE, Anne Perry once again plays her part in adding another one of her signature Victorian mysteries to the Christmas series, which has now become an annual visitor in her readers’ homes. The messages of hope, justice and peace on earth continue to ring true.